Malcom Earl "Mal" Waldron was born in New York in 1926, in the sign of Leo, whose symbolism - we all know - is based on realization, rationality, honor, generosity and nobleness. Saturn is out of sight, so no sense of death, of firmness and malediction is present. Both the man and the musician seem to be the exemplification of a tipical Sun-influenced person. The body is swift, average tall; the forehead is broad and it gives an impression of serenity. Giampiero Cane from the liner notes. A1) Tew Nune (M. Waldron) - 4'36"
A2) Picchy's Waltz (M. Waldron) - 7'22"
A3) Breakin' Through (M. Waldron) - 6'50"
B1) Canto Ritrovato (G. Gaslini) - 5'22"
B2) Lullaby (M. Waldron) - 4'18"
B3) Appia Antica (M. Waldron) - 9'13"
I'll wager the music is better than the sleeve notes. Thanks for sharing. This release has also got me thinking about the series title. 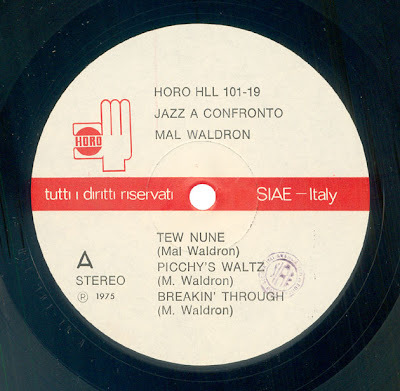 I had always assumed that Jazz Confronto came from the early practice of putting different musicians (often US players mixed with Italian) in the studio together, and that a translation would be a gentler version of the English work confrontation. But looking up 'confronto' I notice that it can also mean something akin to the English words 'comparison' or even 'assimilation'. Both would make sense in the case of the early releases. Of course with solo performances one can only compare across releases. @JfI, what sense do you have of the series title, and had the original motivation gone by volume 12? In the first case, I believe, as I said in the first post, because in this series Sinesio puts to confrontation the italian jazz ways of the great masters (like a Basso, Gaslini, Sellani, Barigozzi, Valdambrini) with the young lions of italian jazz (Schiano, Rava, Urbani, Schiaffini, Pieranunzi). 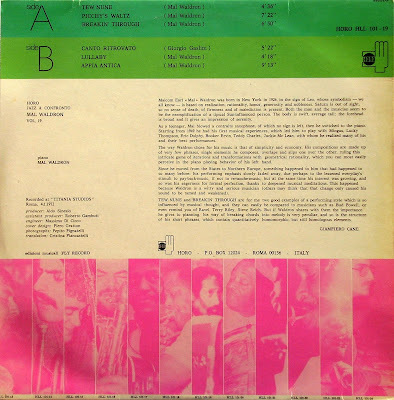 In other recordings, he organized great encounter between the italians of jazz and the best americans jazzmen, like that one of Frank Rosolino and Gianni Basso & Enrico Pieranunzi, or that of Kenny Clarke with Santucci & Scoppa or still that between Johnny Griffin and Franco D’Andrea, Bruno Tommaso e Biriaco, and compares, in fact, their understanding of jazz. "...just because the series is not intended to be open to only some experience and closed to others, is called Jazz A Confronto : comparison of ideas, of generations, styles, sounds, techniques and inspirations..."
Then, the comparison, should not be understood only among the musicians convened in the studio. A "indirect" comparison, for example, it's recorded on the volume No. 12, where the great Teddy Wilson compares with the music of Ugo Calise (italian composer, author, arranger, singer and guitarist, in love with the folk music of his country and jazz, of course). 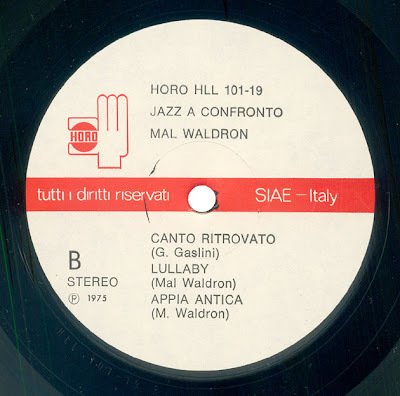 Also in this vol n ° 19, Mal Waldron played a beautiful piece of Giorgio Gaslini (Canto Ritrovato) which is not really a standard, indeed, but that is a traditional song of Lombardy (Milano), which Gaslini says he often heard during the war, and that he has revised in key rhythmic. Sure, it would take the memories of Aldo Sinesio to better understand his motives, or even those of Gianni Morelenbaum Gualberto. But also these, give a good idea of Jazz A Confronto, no? Grazie mille, Jazz from Italy. I am looking forward to hear this solo record. "I'll wager the music is better than the sleeve notes." que buen sonido. Tendras el de Impressions?, lo he andado buscando en la red pero los links estan caidos. 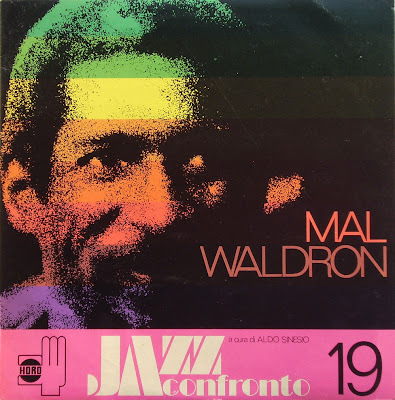 Many thanks for the great Mal Waldron. Any chance for a reupload please, the dl link is dead, thanks in advance! !